When displaying your store's merchandise, presentation is everything. Whether you're showcasing jewelry, antiques, clothing, accessories, or something in between, the 70" Full Vision Display Case from Store Supply Warehouse is a simple retail solution. Offering elegance and dependability, the gray display case will help to deliver a contemporary ambiance throughout your showroom. Featuring gray low pressure melamine laminate finish, the display case offers a neutral color to enhance the aesthetic in your shop. It also features a tempered glass top and front to provide your customers with a full-vision of the product. Additionally, the display case includes two rows of adjustable 1/4" split glass shelves 8" and 10" depth, steel interior standards and shelf brackets. With the white deck and doors in the back, merchandise can easily be removed and restocked. The gray display case has brushed aluminum hardware, and an optional lock and light kit. Wood crating for secure shipping is included in the price of the case. Ready to assemble and available for immediate shipment. 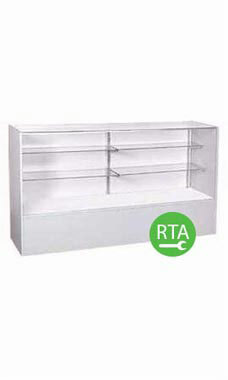 Overall, the display case measures 38"H x 18"D x 70"L.